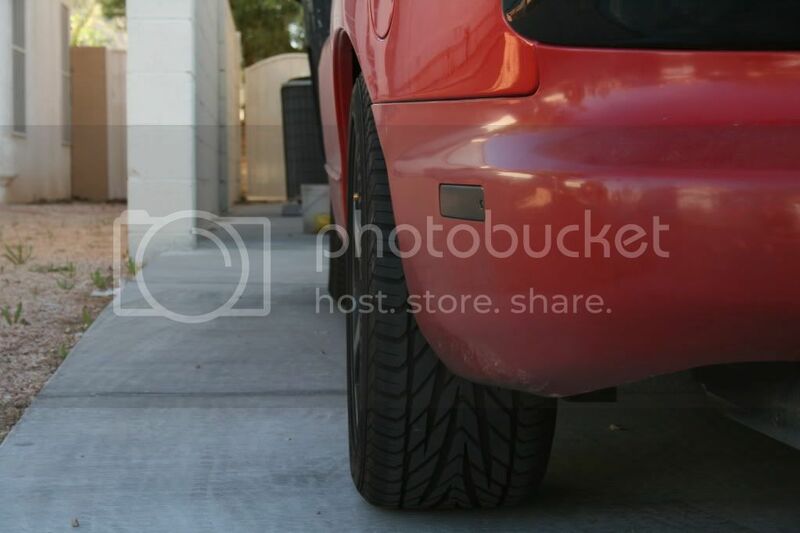 i was planning on getting 1 inch wheel spacers but i feel that they wouldnt be very noticable. i want it to have a b.a. appearance! should i go bigger? 1 inch is a lot. are you lowered? if you take your wheels and tires too far out you will end up rubbing your fenders or possibly damaging them on large bumps. Measure and place the wheels right inside the fender. Proper placement and a nice wide tire give a good stance. Last edited by laux06; 06-02-2009 at 09:13 PM. yea laux that is set up great. mrp what wheels are you running? Not tires, wheels. Are they stock wheels? Last edited by mrp82391; 06-04-2009 at 12:28 PM. people run 11 inch wheels quite often. You will have to hammer in parts of the inner fender well (known as the BFH mod). With a little tweaking it can be done. If you are going to use spacers especially 1" you will be well advised to replace your lug bolts with ARP ones. I run 11" wheels with a 50 mm offset and Nitto NT555Rs 17x35x315. No spacers, No rubbing, No BFH mod but I am on stock rear springs and I am using the SLP jounce pad spacers (lowers jounce pads 1"). 1995 T/A - Mods: Who really cares ... Its just another damn LT1, right? I run em, id recommend getting rid of factory bumb stops, I fabricated some, limit the travel so you don hit fenders, roll he fender lip, and id highly recommend a fully adjustable tubular rear suspension, just my own experiences. i just put tubular lca's,sfc's, and a non adj panhard bar in. if i just put the 17x11 on with a 1inch or 1/2 inch spacer on would every thing function properly. are you lowered? Most of the rubbing on the outer fender depends on how low your car is. If you aren't lowered it will easily work. If you are lowered it will be more of a pain and you may need to buy jounce spacers. If you plan on doing this...like OEM TA said, you better get some different studs bro...that putting on alot a strain on those "weak" studs. You dont want to be flying down the highway and see you wheel roll past faster than you haha! That is not a good thing! Spacers are scary IMO...I love going fast and you have to have confidence in your car when your over 110+mph, when the adrenaline kicks in...if I had spacers I would be shittin bricks bro! those are the studs you need. I have ran spacers on 4 different f body's. At the drag strip and up to 165 mph with these studs and have never had a problem.